Our interpretation boards mention that we don’t use peat, and we’ve been asked a couple of times why that is. There are three main reasons. Firstly, it’s a non-renewable resource – it takes thousands of years for a peat bog to form, but it can be cleared completely within 50 years. It’s also an increasingly rare habitat with its own unique flora and fauna. And lastly, peat bogs act as carbon sinks by storing large amounts of carbon dioxide; when they are dug up, large amounts of carbon are released into the atmosphere, which accelerates climate change. The carbon stored in UK peat bogs is equivalent to about 3 years of total UK carbon emissions. About 70% of most ordinary multipurpose compost is peat; the horticulture industry is one of the main users of peat. Yet gardeners only began to use peat about 50 years ago; until then, many gardeners just mixed their own composts. There are many benefits from buying in sterile, consistent compost mixes, but they don’t have to contain peat. There are an increasing number of alternatives as the technology generally has moved on since the 1970s, and more and more brands of peat-free compost are becoming available. There’s still a bit of an urban myth around that they aren’t any good, but this isn’t really true any more; many gardeners and commercial growers manage fine with the newer peat-free composts, with great results. Here at the Memorial gardens we do also use a mix of garden compost and leaf mould for cuttings and growing on small plants as it’s very cheap, which makes our various projects more sustainable. I checked with two local suppliers today – Leighton Buzzard Garden Centre will have their peat-free compost in sometime within the next couple of weeks, if it’s not already in (when I rang the pallets were just being unloaded, and they weren’t sure exactly what was on those, and what was coming in the next few days); and the National Trust’s Ascott House on the Wing road sells New Horizon compost at a fiver a bag or 3 for £12 – it’s by the kiosk in the car park, and if you tell the car parking attendant you just want the compost, they won’t charge you for entry to the house or gardens! There are ways of persuading the roots to move outside the area of its original pot, but we’ve found that the simplest is just to use a peat-free compost. You can also buy plants grown in peat-free composts from some suppliers – we bought perennial wallflowers from the market stall near Peacock’s in the High Street. This entry was posted in Uncategorized and tagged peat-free on April 4, 2017 by Pippa Sandford. We’ve lifted all the spent annual wild flowers in the top bed by the car park, and we’ve resown poppies, cornflowers and toadflax. These cornfield annuals often need a period of cold weather to start their germination, but the bed’s already full of seedlings, probably from last year. We resow every year to be sure we’ll have a good show of flowers from June and July, though we do then have to thin the seedlings to leave enough room for the remaining ones to grow into stronger plants. It works well in practice, but it feels a bit odd to be sowing seeds, then pulling half of them up! Over the last couple of months we’ve moved a few plants to places where they’ll be happier or look better, we’ve planted bulbs for next spring, sown seeds of California poppies and Welsh poppies, and thinned some of the seedlings of forget-me-nots and borage; all of these provide a lot of nectar and pollen for bees, and by letting seedlings emerge now we’re ensuring they’ll be flowering earlier next year than if we’d sown them in the spring. It does mean that we can’t mulch all the beds, though, or we’ll choke seeds that are still emerging. We’d like to mulch the beds to prevent heavy rain from damaging the soil structure, to keep nutrients in the soil, and to provide places where beneficial insects can hibernate. Blackbirds seem to appreciate a layer of leaf mould, too, judging by the amount they turn onto the paths when they’re looking for worms underneath it. We try to have the gardens looking their best for Remembrance Sunday, which isn’t quite as easy as it is in June and July! We do leave quite a few stems and seed heads for hibernating insects, because many seed heads look good in frost, and because it stops the gardens looking too bare through the winter months; however, we try to balance these ecological requirements with keeping the gardens looking cared for and well tended, in respect of their setting. It’s a difficult balance. Although we’ve started making our own leaf mould, it won’t be ready for another couple of years and we used all our existing stock to make peat-free potting compost; so we’re very grateful to the local residents who’ve given us enough leaf mould for our needs this year. Thank you! 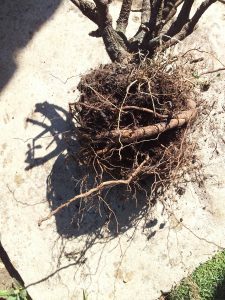 This entry was posted in Uncategorized and tagged Growing cornfield annuals, leaf mould, mulching, peat-free, preparing for winter, seed heads, soil on October 28, 2016 by foe.